Big data. Cloud. Mobility. Security. Sounds like the making of a buzzword bingo blog post, right? But the results of Dell’s second annual Global Technology Adoption Index (GTAI), reveal that organizations actively investing in big data, cloud and mobility have up to 53 percent higher growth rates compared to those who aren’t using the technologies. That’s a strong correlation, not just noise. And more organizations are using security to enable new things or gain a competitive advantage – growing in North America from 25 percent in 2014 to 35 percent in 2015, and growing in Western Europe from 26 percent to 35 percent. That’s one of the reasons Dell commissioned global research firm TNS to conduct the GTAI in 2014 and again 2015. For example, 39 percent of organizations surveyed report that their mobility strategies are leading to improved efficiency, as well as business process improvement and reduction in paperwork (21 percent each). Security initiatives are not only about reducing risk, but are also about driving quicker response to market conditions, with 78 percent of organizations with establish security solutions citing that as a key benefit. “We knew adopting new technologies would help us become more efficient, but we’ve recognized an even more impressive return on our investment,” said Rick Mears, senior vice president/chief information officer for Owens & Minor. The 2015 study is a quantitative survey with 2,900 IT and business decision makers, like Mears, at mid-market organizations (100-4,999 employees) across 11 countries and multiple industries that shows correlations between technology use, adoption, benefits and barriers. 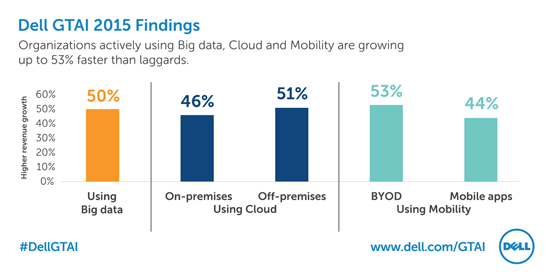 Investment in cloud, mobility, big data and security is correlated with higher revenue growth. These technologies also fuel company benefits, including efficiency and organizational growth goals. Cost joins security as a chief barrier to technology adoption, use and expansion. Business leaders are the drivers for big data and mobility adoption, but they partner with the IT team for cloud and security. Read more here, and for those of you who are visual thinkers, check out this infographic.